Title: 'Carte Du Theatre De La Guerre Dans L'Inde ...'. 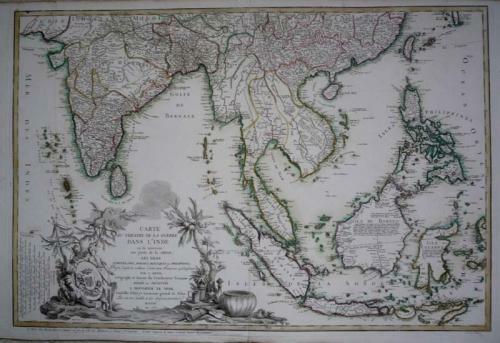 A large and rare map of South East Asia engraved by Bellanger, centered on the Malay Peninsula, encompassing India and South East Asia up to Timor. A decorative title cartouche depicts orientals grouped around a coat of arms with regional products such as porcelain, lacquered umbrellas and fans.